The developments would also be fairly dense—less dense than a downtown block of high-rise buildings, but much denser than an average suburban neighborhood. “The density of OAS1S communities is much higher because of the double land use as a park as well,” says architect Raimond de Hullu. 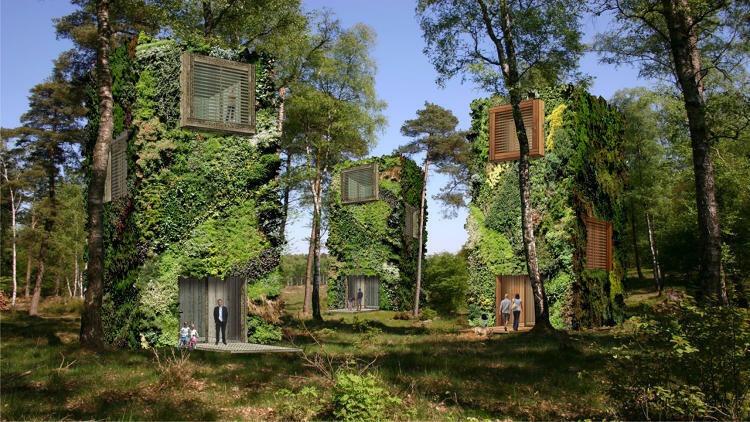 “The concept can integrate a mixed-use of single or multi-family housing, plus hotel or office use. On top of that, leisure and commercial use can be integrated on the ground level, covered by green roofs with tree-like units above,” he continued. To make the units affordable for everyone, de Hullu plans to use a community land trust model. A nonprofit will own the land, and homeowners could sell the properties on top only for a limited profit.